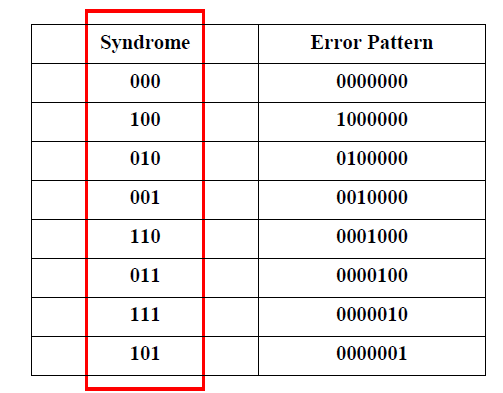 s(Syndrome) detect error position. 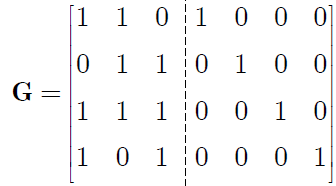 We can know the single-error-bit position in the table below. If s is [0 0 0] and r= [0 1 0 0 0 1 1], it supposes that there is no error and transmitted data is [0 0 1 1]. If s is [0 1 0] and r = [1 0 1 0 0 1 0], it supposes that 2th bit is corrupted, so r should be changed to [1 1 1 0 0 1 0], and transmitted data is lower 4bits, [0 0 1 0]. • This device creates one big collision domain and one large broadcast domain.